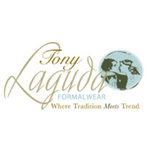 Our family looks forward to providing you with tuxedo rentals & sales, suit rentals, custom suits & shirts, alterations and impeccable customer service. We also offer custom groomsmen gifts and unique accessories. We invite you to come in and experience the difference that comes with an extensive on-site inventory including many designer labels and styles. With over 35 years in the business, we have generations of expertise and treat our customers like family. Come visit us in downtown Ambler, just outside Philadelphia, PA in Montgomery County.